Heartseeker Carvers are minor demons, beloved by Chaos mages and unusually cruel necromancers. Arguably the most merciful—at least as merciful as a demonic being can be, or perhaps less cruel than its brothers—Heartseekers prevent enemies from dealing their allies fatal blows, instead taking it upon themselves to do the honor—a quick, simple act of murder that empowers them to continue battling until surrounded by fallen allies and opponents alike. Creatures of Chaos embodied, Apocalypses revel in madness and unrest, thriving off of the heightened emotions in battle and growing more powerful and frenzied as they continue to fight. Favored beasts of war throughout history, many kingdoms who worship Gonfurian or Vulcanar will have an Inox Apocalypse on their royal sigil, their eyeless faces emblazoned on banners and raiments of war to strike fear into the hearts of the opposing forces. Priest Viziers, highest of their order, do more than simply teach or heal: they inspire. Numerous theocracies, including the fabled Creosian dynasty, will place a Vizier as a seneschal in hopes of its counsel bringing a new golden era to their country. Though some may view a Vizier as dangerous, able to whip up a mob into a frenzy, there can be no doubting of their power, for good or for ill. Feared by midwives and mothers and maidens, an Abyssal Spectre is seen throughout nearly every society as a sign of ill omen. What looks to be a human fetus is cradled, almost lovingly in its arms, is in actuality a strange sort of arcane focus, empowering the Spectre to fulfill some sort of calling, leeching away a living thing’s lifeforce into the charm it bears before disappearing into the night. A being from beyond the stars, Planetary Amaranths have influenced the realms of existence for, assumedly, eternity. Their presence in stylized spirals and staring eyes found deep in tropical ruins and moldering crypts can be found in nearly every ancient culture’s iconography. While some called them bringers of doom, and others worshiped them as gods, throughout time—fickle as it is—humanity has looked to the stars for answers, and found the stars, swirling across the heavens, staring back. While Crusaders are often found in the cavalry and front lines, the far more powerful Holy Crusaders are usually ridden like stallions, her master astride her and issuing orders to the battalion she commands. Yet just because they do not often see the heat of battle themselves does not mean they are weak—in times of peace, they are used as guards for their nigh-impenetrable defenses. The cultural machinations of a Crusader contingent are many-layered, but above all else is the belief that one should die for their commander; the Holy Crusaders are the ones that deal the punishments to those that abandon their callings, or worse, betray their summoners. There are few beings in the world more terrifying to a realm than an army of Lepers—and an Addled Leper contingent has inspired fear in many a monarch. Mindless hordes sweeping through the realm inflicting diseases upon the common folk and leaving crops rotting in their wake, a power- and politically-hungry mage could easily end a dynasty’s reign with a mere threat of unleashing swathes of these monstrosities. There are several known ways to dispatch these fiends, and they all simplify to a single concept: kill them quickly and without mercy, before they do any irreparable damage. A front line fighter, Vanelin Seraphs mix magic and might to deliver punishing blows to their opponents. Most often employed by theocratic kingdoms during times of civil war, their most recent use ended in the Deirinian kingdom’s corrupt High Pontifex being dethroned, with Surathli herself having said to have played a role in the final battle. However, while Vanelin Seraphs have an above-average pool of mana, they do not make good spell casters, for much of their magical energy goes into empowering their blows. Nearly unrecognizable from their Seraph brothers, who were created for battle and the protection of the Azure Dream, Ophan are the healers, streaking across the battlefield to assist the wounded and dying. Narklin Ophan in particular are beloved by Surathli due to their prowess in healing magic: not only are they able to heal, but they grant the ability to all under their domain as well, quickly turning the tide of battle. Not made for front line fighting, if threatened, a Narklin Ophan depends greatly on its prowess in spellwork, having little to fight with in terms of martial combat, healing itself while buying time for allies to come to its aid. 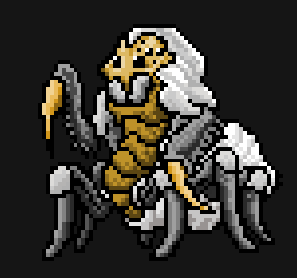 The patrons of Regalis, Goddess of poison, who created the arachnalisks in her own image, the Spitting Arachnalisk was the first of its kind created and is arguably the most widespread of her children. As their name suggests, a Spitting Arachnalisk waits until its prey makes the first move to attack before spraying their venom onto the prey, which is then absorbed through its skin, necrotizing the creature’s innards from the inside. One of the more sinister members of the Arachnalisk family, a Woolly Arachnalisk is not much danger on its own, but in a pack of its kind it reveals its opportunistic tendencies: its own venom, while normally harmless, amplifies tenfold in prey that has already been envenomed by its pack mates. Preferring immobile, paralyzed targets to still-moving prey, a Woolly Arachnalisk generally sticks to the back lines behind the stronger members of its pack, waiting for the opportune moment to strike. Hailing originally from Aeolian’s domain, the Aspects are generally peaceful guardians of their realm. Docile and kind, they are known by many to aid travelers lost or in danger, and prefer hiding away than showing themselves to strangers. Yet there lies the wild fury of an entire forest beneath their leafy hide when roused that does not easily abate. Able to perform acts of acrobatics that belie their bulky build, these creatures hit ruthlessly while raining down spells onto their opponents—and, once offended, they will give no mercy, fighting until either they or their enemy has been killed. Ebony Ents are hardy creatures, created by one of the first nature mages as rank-and-file soldiers, built to form a living shield wall. As time went on, others followed in her footsteps, breeding their ents with maples and yews and willows—indeed, for the rich and vain, a garden of Ents was deemed to be worth its weight in resources, both as a sign of status and a sign of strength, for who would dare attack a general strolling through the palace gardens when the very trees would rise and attack, then sink back into the soil with new nutrients to feed from? The practice has mostly abated in this era of XX16, though some of the older, more vain kingdoms—perhaps Fleurian most particularly—has a thriving arborium, though as a mainly economical kingdom, it serves as a place of peace rather than a stronghold. One could not call Crusaders cruel by any means. Yet nor could you call them anything but creatures of war—for a cause dependent on their summoners. The least “noble” of the Crusaders, if their slaughter could be called noble, Dusk Crusaders earn their name from their strangely muffled nature—the crash of metal plates on metal plates and earth rending against harder-than-steel hooves sound half a league away rather than galloping past you, sword drawn. Perhaps a cause of ancient magic long forgotten by mortals, akin to an obscure branch of invisibility, but whatever the case may be, a single Dusk Crusader can decimate an entire village in the course of the night; when the sun begins to rise, there lay only ruined buildings and blood-soaked ground, with the sound of galloping horses far off in the distance. My adventure log is gonna be a bit different. It won't be about character deaths or awesome screenshots. It's more like a viewpoint of a very scientifically inclined mage, a sort of magizoologist who catalogues all the creatures and gods and demons of the world and writes about their places, their origins, important facts. To essentially give me breathing room, Grand Magister Sirius' field guide will be updated whenever I come across a new monster in a new save file. The posts will come in batches of 2 or 3. If this picks up, I'll probably start writing short stories about the history of the realms and such, trying to turn Siralim 2 into a sort of world all of its own. Page created in 0.218 seconds with 60 queries.